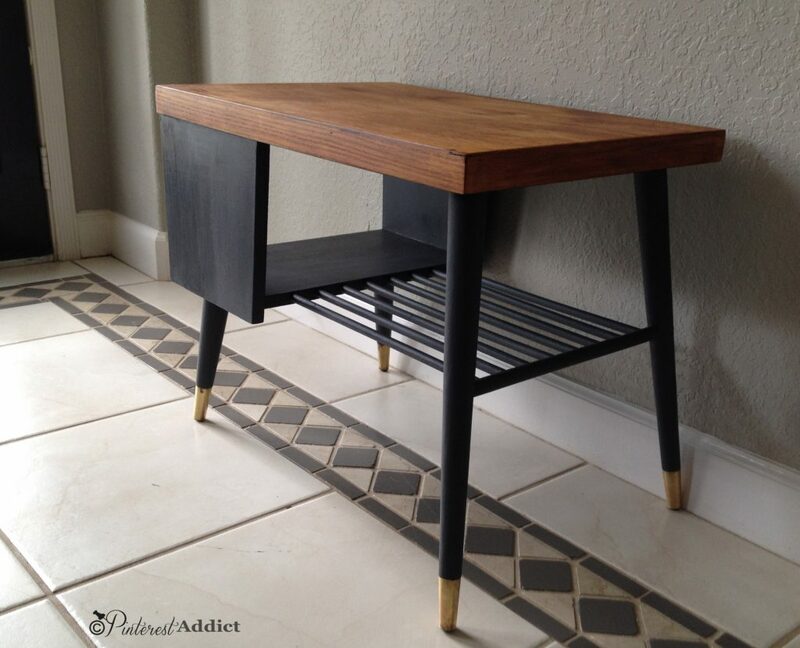 This is one of my favorite mid century modern end table makeovers. Yesterday, a couple of my girlfriends, my niece and I hit seven thrift stores. SEVEN. It was exhausting but a lot of fun to be with people who are as excited by thrift store treasures as I am. While my one girlfriend found lots of things, I found only one. This one. I had been looking for a bedside table for my son’s room for a while now. And for $17, this would work perfectly. As you can see, the previous painted everything but the top of the table, including the brass feet. So after using my handy dandy cordless Ryobi sander on the top, I broke out this stuff. 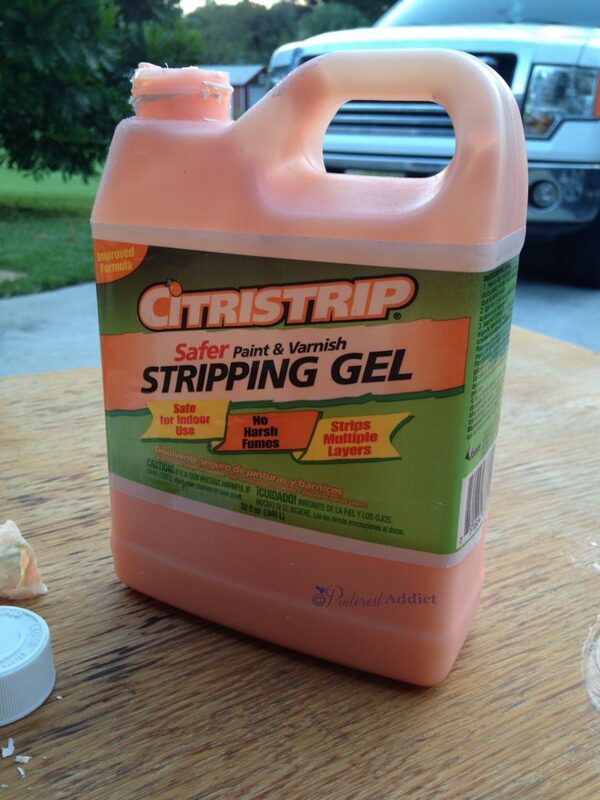 I love Citrustrip because it works well, but even more importantly, it doesn’t smell bad. It smells citrusy. So, I slathered some Citrustrip onto the brass legs. Because I am impatient, after just a few minutes instead of waiting the recommended time, I started to scrape off the layers of paint on the feet. The paint came right off, except for the places I missed. I just used the goo I had scraped off and applied it to the parts that didn’t come off. Worked like a charm. After Citrustrip – stripped feet – sorry for the blurry pic. 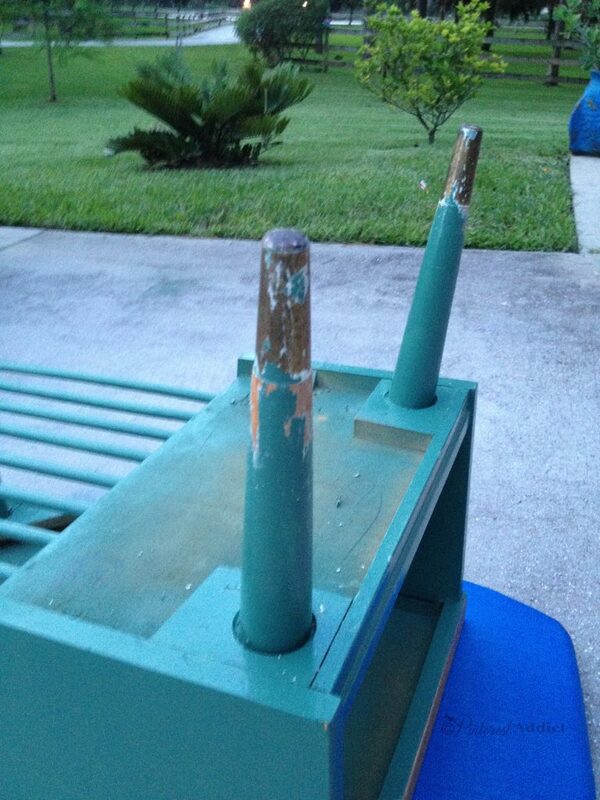 As you can see in the above picture, after the paint came off the brass, the brass was pretty tarnished. 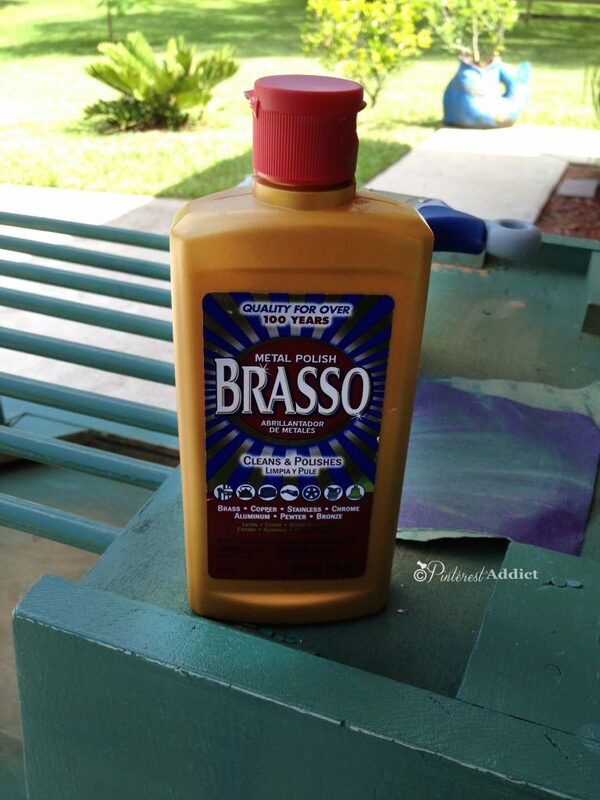 So, out came another one of my favorite products for brass; Brasso Metal Polish. I just put a dollop on an old rag and rubbed the tarnish right off. It takes a few minutes to completely get the tarnish off, but it’s well worth the effort. Next, I taped off the feet and the top of the table, sanded down the legs, gave everything a good wipe down and started to paint the rest of the table. 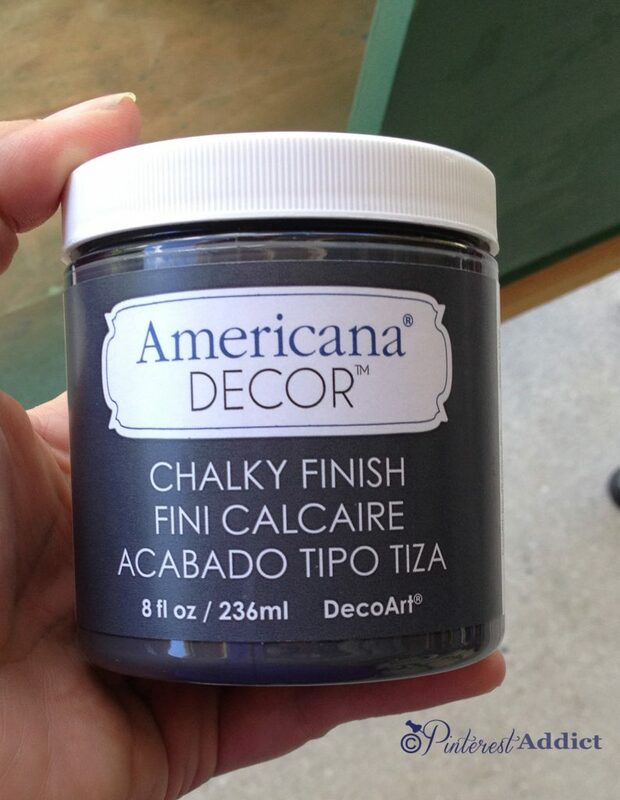 I used Americana Decor Chalky Finish Paint. I had received a few jars when I went to the SNAP! Conference. I finally had a piece to try it on after all these months! The color is called Relic, which is a dark gray. Now, you know I’m not a user of chalky paint. I love glossy finishes. But in this case, I didn’t want it to be glossy, since it was going into my son’s room. I thought a more matte finish would work better. Other than wiping the painted parts down with a deglosser, I didn’t have to do any other prep work (although I did sand down the legs where the paint had come off when I took the paint off the feet). While I think the coverage was great after the first coat, I was able to give it a second coat after just about 30 minutes because it dries super quick. I have to say, I was pleasantly surprised by the paint. It went on pretty smoothly, didn’t have a stinky smell and best of all, NO DRIPS like with spray paint. Drips are my nemesis. Hmmm… I might have to use this stuff more often. After it was dry, I used their soft touch varnish, which was easy to apply and didn’t have an odor either. 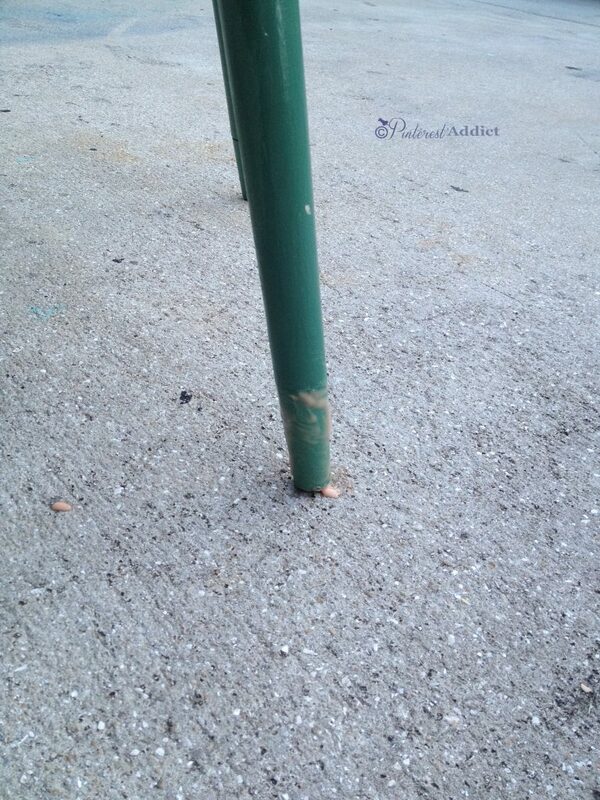 All was going so well… and then I tried to stain the top of the table. What a mess. I think it was mostly user error or maybe I didn’t sand it enough, although it was perfectly smooth and free of any kind of polyurethane when I started. I wiped it off as best I could and tried another stain product, of course after giving it a quick cleaning and another go with the sander. No good. Then I tried again with a third product. It didn’t take well either. So, I think it’s the wood, not the stain’s fault. I gave up. At this point, it still looks spotty. I think I might have to replace the top of the table at some future date. I still think it’s an improvement on how we found it. My son loves it. I love the little brass feet! I’m going to let it cure for a few days before I move it into his room, although I’m not really sure I have to. 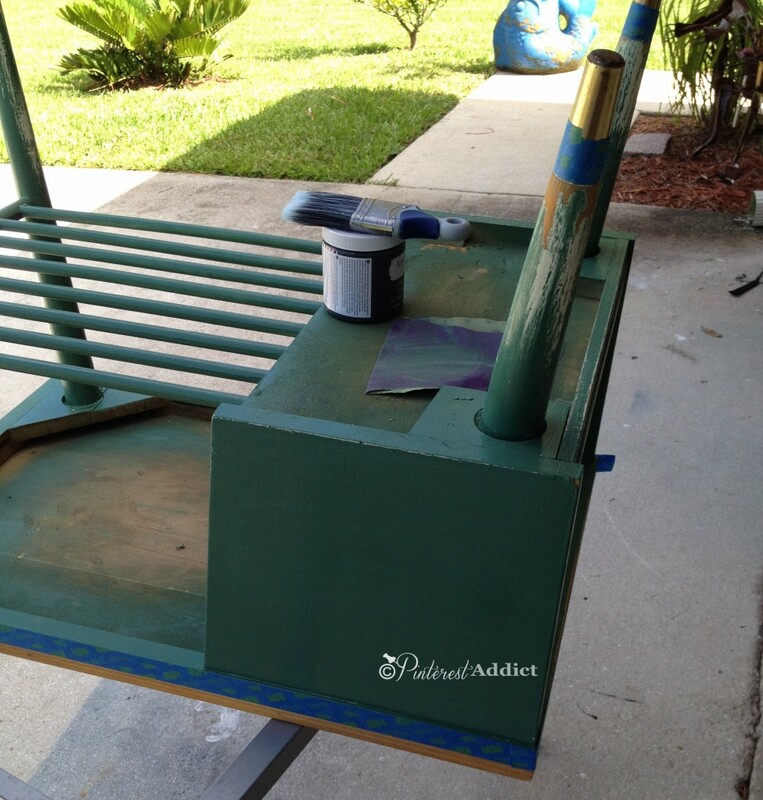 Well, that’s how I refinished his bedside table, stain issues and all. If you know of a way to make the table take stain more evenly, let me know. 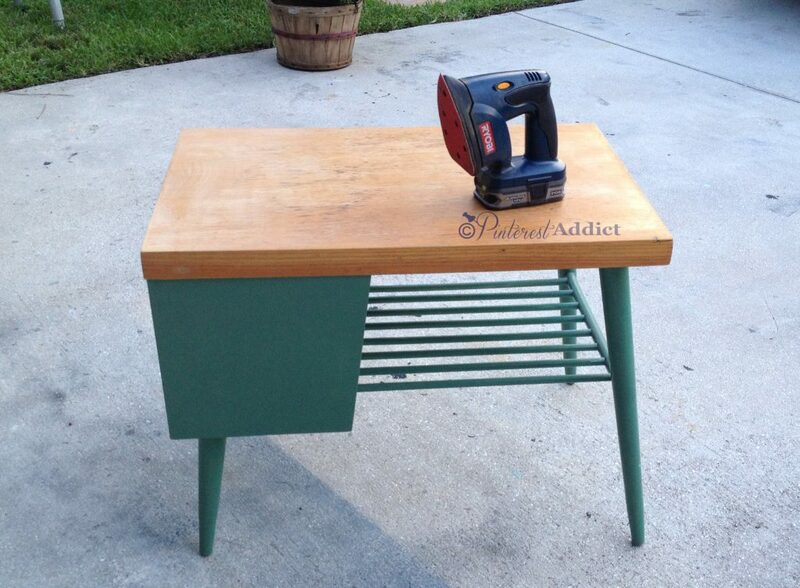 By the way, before you update vintage or antique furniture, check out this post to see how to check the paint for lead. 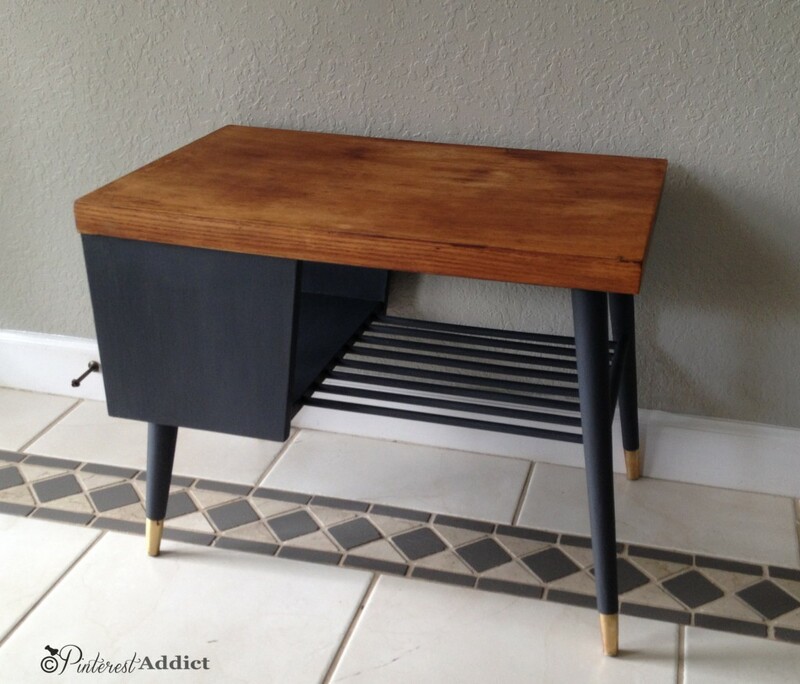 Thanks so much for stopping by and checking out my mid century modern end table makeover! Note: This is absolutely NOT a sponsored post. Although the paint was given to me in a swag bag, Americana Decor has no idea I wrote this post. All other items were bought by me and are truly some of my favorite tried-and-true supplies. 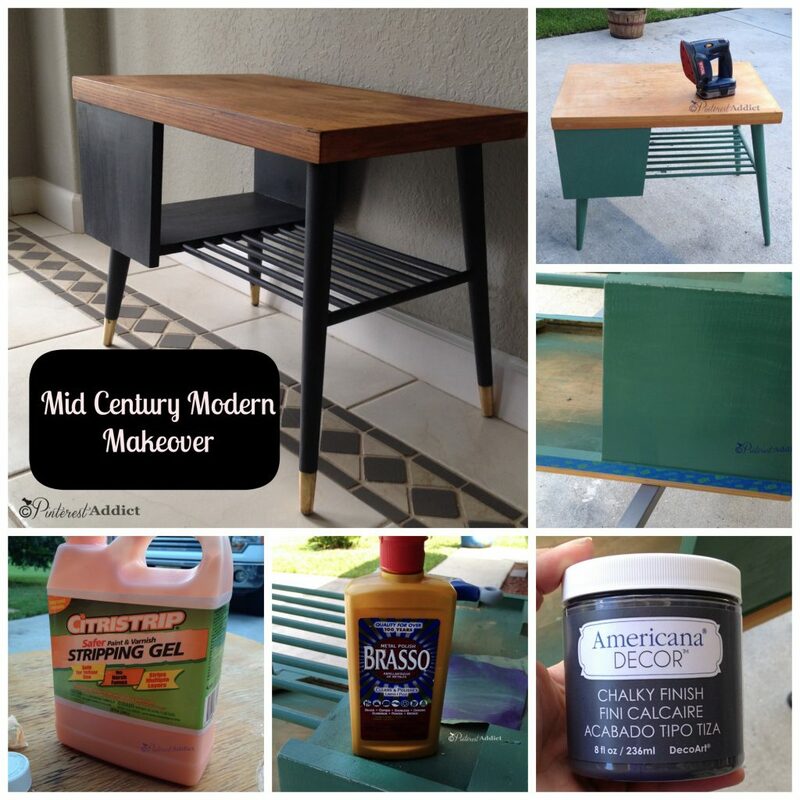 Thanks for all of those furniture refinishing tips, Eliesa! I think the table looks GREAT. I don’t even see the spotty places you are mentioning on the top in the photos. I’m sure your son will love it. Can’t believe how great the brass feet turned out! I think it turned out great, I love the thick block top and the unevenness of stain gives it character! Btw sold two of glasses I found that day for $75! Glad Vinnie loves it too! I had a great time shopping with you, but it was a looooong day:). Popped some tags and pooped our selves out. You have quite the eye for those things! I went to Faith Farm yesterday and was completely overwhelmed trying to see those little etchings. I think I’ll wait till I get my hands on your books 🙂 We have to do it again soon – although I might bring some trail mix to keep me going! I love that, it turned out so cool! Those brass feet make my heart go pitter-patter! Just moved my son’s room to the guest room, and finally set the side table in there… those little brass feet made the whole room for me.